Cebu City Traffic Operations Management (Citom) has 307 bench warrants for private and public vehicle drivers with unsettled traffic violations. It served seven warrants yesterday and will serve more next week. Meanwhile, traffic improved significantly in the North Reclamation Area (NRA) when Logarta Street was opened to two-way traffic between 5 p.m. and 7 p.m.
TOP STORIES. 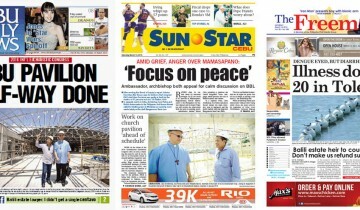 The front pages today of Cebu’s 3 English dailies. The P550-million Eucharistic Pavilion will be used for the gathering of the religious during the 51st IEC in January 2016. But once the gathering is over, the facility will be used as a pastoral center and a new minor seminary for the Archdiocese of Cebu. It would also serve as the “biggest evacuation center” in Cebu. Under a memorandum of agreement, contractor Duros Development Construction fully shouldered the cost of building the pavilion in exchange for usufruct rights over part of the seminary property for 25 years. The Eucharistic Pavilion is now 50.8 percent complete. The estimated completion date is in September this year. Citom served seven warrants yesterday to drivers who have unsettled traffic violations. It will serve more warrants, which were issued by Municipal Trial Court in Cities Branch 7 Judge Francisco Seville Jr., next week. It has 307 bench warrants for private and public vehicle drivers. Common traffic violations included disregard of road signs, making wrong turns and parking on no-parking zones. Meanwhile, at least eight erring taxi drivers were reported to the Land Transportation Franchising and Regulatory Board-7 for refusing to comply with the provisional taxi fare decrease. Citom noted that that traffic improved in the NRA when Logarta St. was opened to two-way traffic between 5 p.m. and 7 p.m. The new adjustment is the third one implemented by Citom for the NRA. Implemented starting last Thursday, it coincides with the truck ban, giving opportunity for more light vehicles to pass the NRA. However, jeepney passengers are confused with the several changes made in the rerouting plans since March 5 when traffic in the North Reclamation Area was disrupted by rehabilitation work on the S. Osmeña Road.